A vacation spent at the luxurious Villa Paradiso promises to be an unforgettable experience. 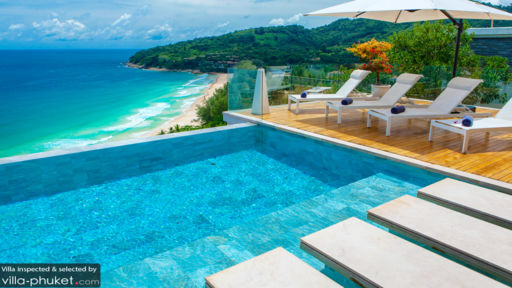 Set above Naithon Beach, the villa overlooks a scenic landscape made up of the Andaman Sea, a white sand coast and lush tropical foliage. A wide array of plush amenities, like the well-equipped gym and spa room or entertainment room, leaves guests with plenty to do during their stay. A team of professional staff are available to attend to your every need, ensuring that you won’t have to lift a single finger during your stay. Five bedrooms sleep a total of ten guests at Villa Paradiso. Polished wood panel flooring, pristine white walls and contemporary pieces adorn all bedrooms. 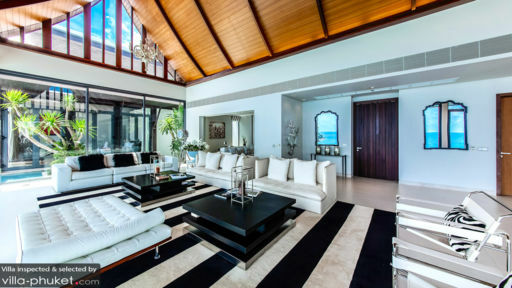 The master bedroom, set right beside the outdoor deck, offers easy access to the infinity pool and views out to the sea. It comes furnished with a pillowy king bed, walk in closet, AC, couch and en suite with double vanities, shower recess and bathtub. Guests will enjoy picturesque ocean views from all four guest bedrooms. A private terrace extends out from each room, providing a nook for an afternoon of tête-à-tête, curling up with a good book or enjoying a sundowner. Two bedrooms feature king beds, while the other two are furnished with a double bed. Generous closet space, AC, deck chairs, bathroom utilities and an en suite with rainshower facilities are amenities common to all bedrooms. The sparkling 17 metre infinity pool is the focal point in the outdoor deck of Villa Paradiso. A wooden deck, lined with recliners and sun umbrellas, frames both ends of the pool. Here’s where sun seekers and cocktail lovers gather to enjoy the sea breeze and panoramic ocean views. Step past the sliding doors from the outdoor deck, and you’ll enter a commodious open-plan living and dining area. An elaborate chandelier dangles from the vaulted ceiling, adding an ornate touch to the interiors. A twelve seater couch frames a coffee table, the adjoining dining table offers seats for ten, and a sleek bar countertop doubles up as a breakfast bar or cosy snack spot. Amenities, like the oceanfront fitness and spa room, entertainment room and office area, ensure that vacation makers are equipped with all that they need to check items off their daily itinerary - whether it is catching up with their fitness routines, clearing their inboxes or indulging in a spa treatment. Villa Paradiso is a full-service property with housekeeping services, security service, guest services and airport transfers. A baby cot and high chair are available at request. Amenities available at additional cost include: in-villa massages, laundry service, personal driver services, car rental and personal chef services. 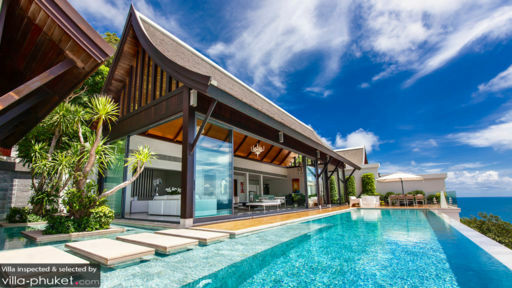 Villa Paradiso is located along close to Naithon Beach in north-west Phuket. Situated away from the central areas, the coastal town offers a serene, relaxed ambience. It’s an ideal destination for family vacationers and couples seeking to get away from it all. The villa offers easy access to the beach, restaurants, beach bars, spas and yoga studios. Choose from an array of dining options, which includes venues like Naithon Beach Club Restaurant and Bar, a local eatery dishing out tasty Thai fare, Vero, an Italian restaurant with views out to the Andaman Sea and Shameena Restaurant and Lounge, a cosy establishment with great service and seafood dishes. In the mood for sundowners? We recommend Malaiwana Beach Bar for its prime seafront location and well-concocted beverages. When you’re not sunbathing upon the white sand shores of Naithon Beach, unwind at luxury spa venues like Dhatri Spa at Pullman Phuket Arcadia or Jara Spa at Trisara. The latter offers an incredible ‘Royal Trisara’ treatment - a six-handed massage administered by three therapists. The tranquil Baan Yoga Phuket features a range of drop-in yoga and meditation classes. Pullman Phuket Arcadia also offers a family-friendly experience with amenities like a kids clubs, as well as a variety of yoga, aerobics and Muay Thai classes. Adventure lovers will enjoy the surge of adrenaline that comes from ziplining across a jungle terrain at Flying Hanuman or wakeboarding at Anthem Wake Park. Spend time bathing and feeding the wildlife at Elephant Jungle Sanctuary Phuket, a centre dedicated to elephant rescue. Or bask in nature’s glory at the Sirinat National Park, a conservation site that encompasses stunning beaches, evergreen forests, wildlife and marine life.